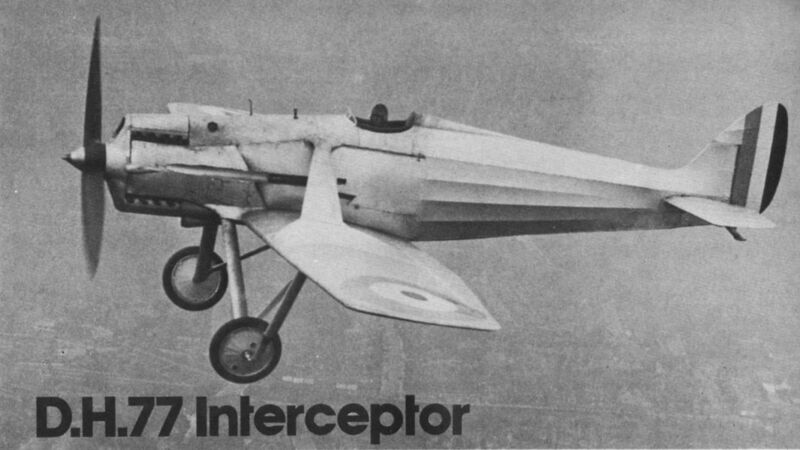 ONE of the most interesting service types produced in recent years is the interception Fighter, designed and built by the De Havilland Aircraft Co., Ltd., and shown in the accompanying photographs. The machine ДальшеMore>>> was designed for the Halford-Napier "H" engine illustrated on the next page. In spite of the relatively low power (something over 300 b.h.p), this machine has a performance comparable with that of machines fitted with much more powerful engines. This is due largely to the small frontal area of the "H" engine, but also, of course, to the fact that a smaller engine enables a reduction in aircraft size to be made, less petrol has to be carried for a given duration, and so forth. The "H" engine was designed by Maj. Halford, and the building and experimental development were undertaken by the Napier firm. 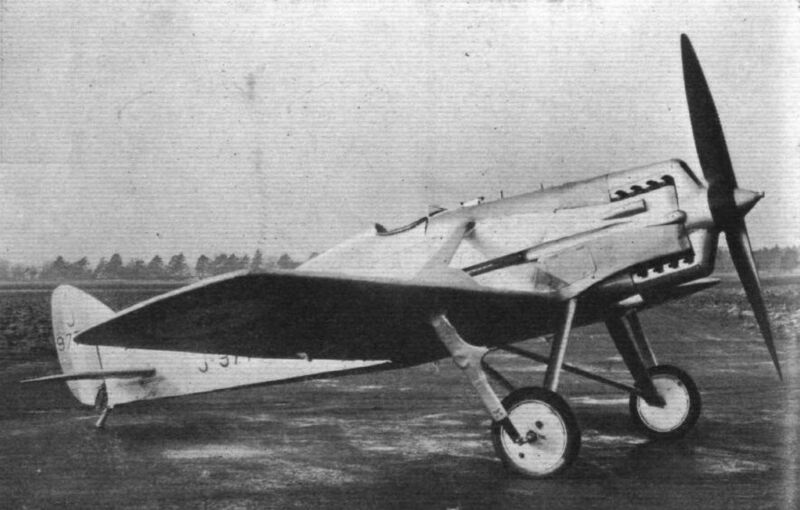 The unmarked D.H.77 shortly after completion. The trough for the port side machine gun is seen, and the distinctive streamlined overwing struts are evident. The Aldis sight has yet to be fitted. 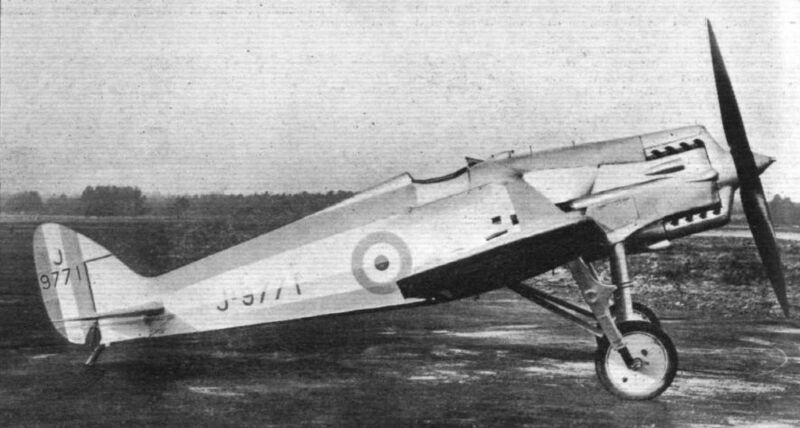 The D.H.77 prototype J-9771 as shown in the New Type Park at the 1930 R.A.F. Air Pageant at Hendon, with the original Napier E.95 Rapier Srs. I. The De Havilland Interceptor Fighter with Napier "H" engine. Above, the D.H.77 at Martlesham Heath during official trials, which were disrupted by engine troubles. The service serial J9771 is carried. Below, a view which displays the slim fuselage and all-moving tailplane to advantage. NO SERIALS. 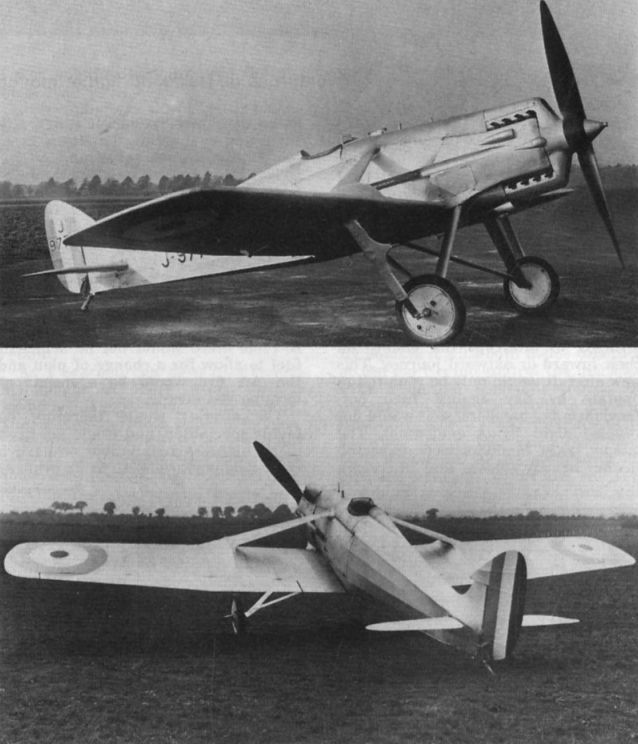 These three rare photographs show the prototype de Havilland D.H.77 in its original Rapier Srs. I form. Although contemporary military markings have been painted on the wings and rudder, the fuselage red, white and blue R.A.F. 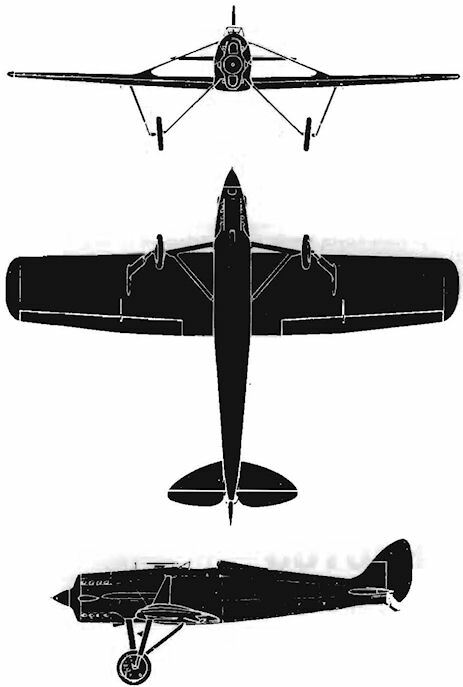 roundels are missing; likewise the serial J-9771 from the rudder, fuselage and wings. Note the Hucks ground starter claw on the wooden propeller boss. The head-on view illustrates vividly the low frontal area of the twin-crankshaft, sixteen-cylinder, air-cooled Rapier, and shows the ,303-in. machine gun channel on each side. The Rapier Srs. II cowling was designed for engine test purposes only and no guns were allowed for. Compare the size of the tyres on the two versions. The positioning of the pitot head on the starboard outer undercarriage strut is noteworthy. The "H” cylinder arrangement of the Napier Rapier imparted unique lines to the nose of the aircraft it powered. This view also emphasizes the ungainly undercarriage. 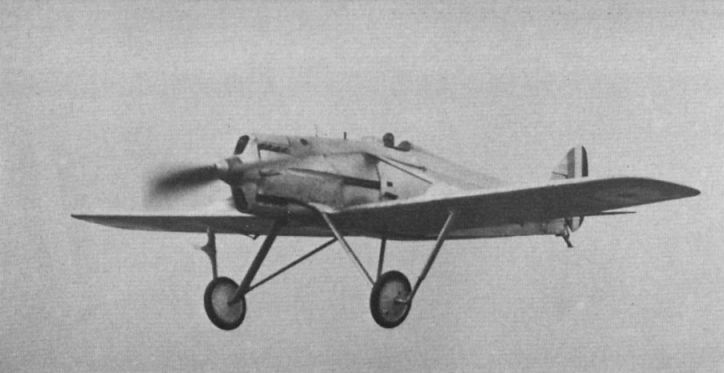 The D.H.77’s performance on its relatively low-powered engine proved to be almost identical with that of the Fury, the eventual winner of the F.20/27 competition. First public appearance, as New Type No 5, at the 1930 Hendon Pageant, complete with Aldis sight. Photograph shows the telescopic gun sight in position, immediately in front of the windshield. 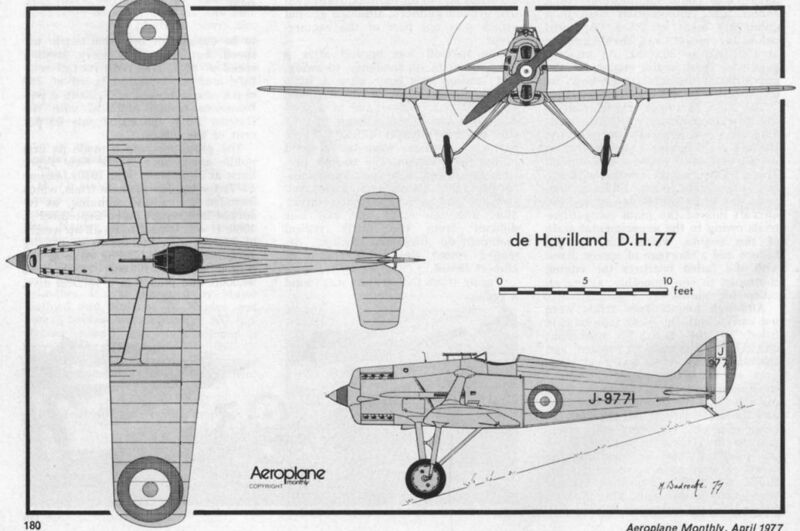 The D.H.77 prototype J-9771 with modified cowling, exhaust stacks and external oil-cooler for the Napier Rapier Srs. II installation. Before the name Rapier was adopted, this sixteen-cylinder engine was referred to as the Napier-Halford "H" aero engine.